Jasper loves to stop by the carrot patch on his way to school to munch on some of the delicious, delicious carrots–until the day that the carrots start to follow him. They follow him everywhere, especially when it’s dark. And no one will believe him! Finally, Jasper decides to put an end to the creepy carrots once and for all. 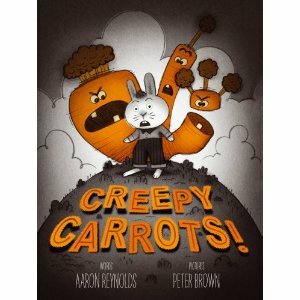 A great new book in time for Halloween, Creepy Carrots is just a little bit creepy with a humorous twist. Mostly brown illustrations allow the orange of the creepy carrots to pop out on each page. It’s a very fun picture book; check it out!